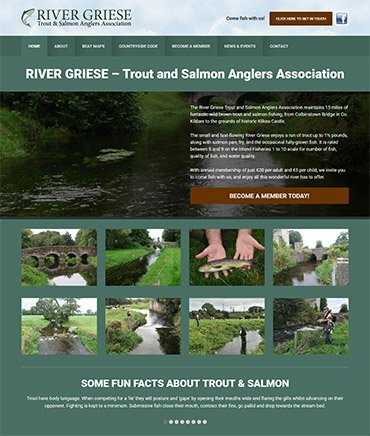 The River Griese Trout and Salmon Anglers Association was recently revived after a lull of some years, to maintain 15 miles of fantastic wild brown trout and salmon fishing along a small and fast-flowing river in Co. Kildare, which rates between eight and nine on the one to ten scale operated by Inland Fisheries (Ireland). As part of its revival, the new committee decided to have a website built, to serve Association members and ‘outside’ anglers alike. They came to us to build it for them. To showcase the hidden gem of the River Griese and the fantastic fishing it offers. To provide a facility for membership applications/renewals. To provide a facility for reporting catches, incidents of pollution, etc. To provide details and maps of its eleven fishing ‘beats’, and the ‘Countryside Code’ that it asks anglers to abide by. Our copywriter then liaised with a committee spokesperson to get all detail needed, before composing and compiling all material in the manner in which it could be best presented on the site. Our designer took all material supplied and used it to create a stunningly-attractive site, with a colour scheme that screams of the outdoors and strategic use of gallery images that make you just want to get up and go fishing. Downloads such as Beat Maps, Association Rules, and the draft Association Constitution were arranged so they can easily be found and accessed, with the entire site being fully responsive for viewing on mobile devices. While SEO was not as major a consideration on this project as it would be on most others, we still paid our trademark diligent attention to both on-page and off-page SEO measures, such as keyword placement, image tags, meta titles, etc. The end result is a fantastic website that we (and our clients!) believe compares more than favourably to the website of any other angling association or fishing club in Ireland. What is two - 0?